You are at:Home»Arts & Entertainment»Cinema & TV»March 10, 2019: Captain Marvel, Throw Out the Controversy and Enjoy the Movie! On March 10, 2019, we offer a mini-review of the latest Marvel Cinematic Universe (MCU) blockbuster film Captain Marvel. Unfortunately, even prior to the release of the movie on March 8, 2019, coincidentally International Women’s Day, tremendous flak developed over the star, Actress Brie Larson, making comments seen by some as anti-White Male. The result of the fallout from Larson’s unfortunate comments has been extreme, with scathing articles and reviews denouncing the film, often by people that did not even see the movie! Robo-reviews and comments on blogs and movie sites have flooded the media, both with negative and with supportive comments out of proportion to the amount of people that actually saw the film. 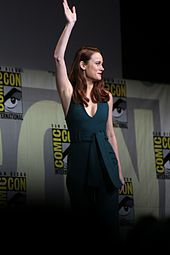 Larson made comments bemoaning the prevalence of White Males in reviewing movies and at artistic venues such as Comic Con when discussion, criticism, and or review of either the performance of females or the material aimed at a female audience is presented. Additionally, Larson applied the same “keep White men out” opinion when it comes to the performance of “colored people” or the artistic product aimed at racial minorities. Larson promoting Captain Marvel at the 2016 San Diego Comic-Con International. Photograph by Gage Skidmore. When the world basically erupted at her “anti-White male” comments, Larson did not back down, but instead expanded on what she meant, saying (words to the effect) that the ranks of critics and reviewers were mostly White males and that diverse artistic products deserved diverse comment and criticism. Meanwhile, offended White males and conservative media threatened to boycott Captain Marvel and any other film Larson shows up in. People on both sides of the debate bombarded movie review blogs and websites (such as Rotten Tomatoes), trolling those sites with fake positive and fake negative reviews, making reviews of the movie highly suspect. In fact, Rotten Tomatoes felt compelled to remove thousands of reviews from their database and has stopped allowing reviewers to review movies that have not yet been released to prevent trolls from attempting to either falsely sink a movie’s chances at the box office or falsely inflate a film’s quality rating. Image based on Logo of Rotten Tomatoes by Emily Oberman from Pentagram, modified by Throast. In spite of being initially somewhat insulted by what we thought were insensitive comments by the title character in Captain Marvel, we paid our own way (including extra for the 3D viewing) to the march 9, 2019 matinee showing of the film and in the fewest words possible, we liked the movie. In spite of some claims that Captain Marvel was the “first” female centric superhero movie from Marvel, it is not. Ever hear of Elektra? Way back in 2005 Marvel had a female superhero headliner. And besides, DC has also pulled off the female superhero thing already, think Wonder Woman (2117). How about Catwoman (2004)? The strong woman theme has been done and claims about Captain Marvel being somehow “new” in this regard must be limited to the fact that the Marvel think tank has changed a normally male character into a female character. And yes, the adaptation works just fine. While we are generally positive about movie reviews (and hesitate to provide spoilers that could ruin a film for you), we in all sincerity believe Captain Marvel is up to snuff in all its dimensions, casting, directing, acting, special effects and story line. Is it perfect? No, but neither is any movie ever made. Nit pickers can claim the young Nick Fury and the young Colson characters that are computer altered to appear years younger than they really are do not look “quite right,” but seriously, the effects are state of the art and we cannot imagine anyone else doing better. We like Marvel movies and Captain Marvel is a worthy addition to the MCU. We liked Avengers: Infinity Wars and Aquaman better, but in no way does that mean we are not glad we went to see Captain Marvel and were in fact entertained at a level we have come to expect from Marvel movies. So there, Brie Larson, you get a favorable review from a White Male. Throw it out if you would like! 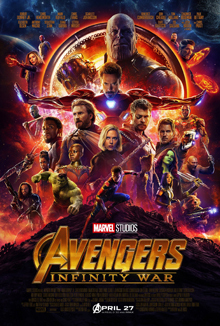 Question for Students (and others): What is your favorite Marvel movie? If you liked this article and would like to receive notification of new articles, please feel welcome to subscribe to History and Headlines by liking us on Facebook and becoming one of our patrons! Roussos, Eleni. Marvel’s Captain Marvel: The Art of the Movie. Marvel, 2019. Titan. Captain Marvel The Official Movie Special. Titan Comics, 2019. The featured image in this article, a U.S. Air Force photograph by Kenji Thuloweit showing behind the scene of the set of Captain Marvel during filming at Edwards Air Force Base, Calif. April 20, 2018, is a work of a U.S. Air Force Airman or employee, taken or made as part of that person’s official duties. As a work of the U.S. federal government, the image or file is in the public domain in the United States.